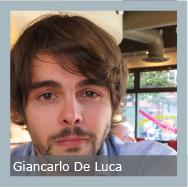 Giancarlo De Luca earned is bachelor degree in Physics from the University of Pisa in 2005 with the thesis: "Quantum Cryptography". In 2009 he completed is master degree thesis in theoretical Physics at the University of Pisa with the thesis "Linear response theory for complex systems" .He started his PhD in Statistical Physics in 2009 at SISSA - International School for advanced Studies, Trieste, Italy where he focused on the application of probabilistic methods to social sciences and biology. He obtained his PhD in 2013 with the thesis "Decision Making in complex environments: an adaptive network approach" . Since november 2013 he is post-doctoral fellow at EPIcx Lab working on computational epidemiology. During his master and PhD studies he mainly focused on probabilistic methods applied to social sciences and biology. He used tools such as renewal theory, continuous markov chains, continous markov processes and non-markovian non-stationary processes where ageing is present. He investigated stochastic processes on and over the networks, focusing on stochastic adaptive network models where the dynamics of the network and the dynamics over the network are coupled together; these systems provide a natural framework to tackle collective decision problems in complex environments. Since 2009 he is working in the context of the project HARMsflu "Harmonising multiple scales for data-driven computational approaches to the modeling of influenza spread" investigating the relevance of age cohorts and school hollidays in metapopulation models for influenza spread.